It is the only living species of the genus Galeocerdo and is also known as sea tiger, but it should not be confused with another species called leopard shark (Triakis semifasciata). It is called “tiger” because of the dark vertical stripes on its body. It belongs to the order Carcharhiniformes, the Carcharhinidae family, and the genus Galeocerdo. This shark is one of the largest that inhabit the oceans only smaller than the whale shark (Rhincodon typus), the basking shark (Cetorhinus maximus) and the great white shark (Carcharodon carcharias). It reaches a maximum length of 7.5 meters but on average measures between 3 and 4.2 meters long while its weight ranges between 385 and 635 kilograms. This shark has dark stripes on its skin similar to those of the land Tigers. However in the case of these sharks these bands fade as the individual gets old. The background color of their skin is bluish green or dark gray in the upper area and the ventral region is a yellowish color or white. Its fusiform body has a narrow snout and a blunt nose; its tail has the upper lobe larger than the lower, and its mandible has serrated teeth important to break the hard shells of the clams and the sea turtles. It possesses an excellent sense of sight as well as smell. The tiger shark is found in tropical and subtropical waters around the world but mostly inhabit a range between the parallels 45 ° north and 32 ° south. Its presence ranges from the east coast of North America to the east coast of Brazil, including the Gulf of Mexico. The oceans of China, India, Africa, Japan and the Pacific Islands are also places where the tiger shark dwells. It is a saltwater species and often approaches near the coasts with relatively shallow waters (2.5-145 meters deep). It inhabits seagrass, but also near atolls and even estuaries. It does not always stay in one place, so its habitat is changing. The tiger shark diet is made up of fish, mollusks, crustaceans, sea turtles, seabirds and even mammals such as the dugong. It also consumes small sharks and the remains of dead whales or can even venture to attack the wounded and immobile cetaceans. 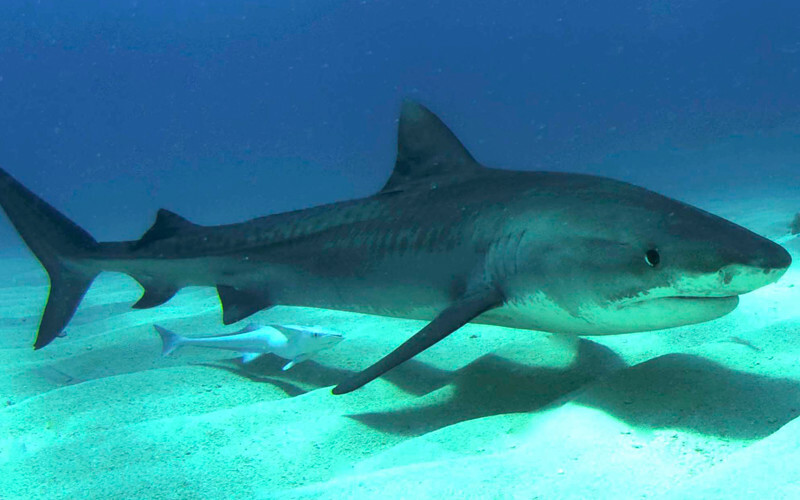 Tiger sharks have an enormous appetite and can eat almost anything they find in their path. That is why, if they run into non-edible objects or junk, they do not hesitate to eat them even without trying them first. In their stomachs trash, bags, and even license plates have been found. They can camouflage with the environment and thus easily trap their prey. However, these sharks have one disadvantage: if their victim begins to flee, they recoil and do not pursue it since they do not engage in high-speed chases. Although they have a reputation as a ferocious predator, they can survive several weeks without anything to eat. The tiger shark is a fish that prefers to live alone unless it is in the mating period. During that time it meets with other tiger sharks and groups establishing a social hierarchy based on their size, so larger individuals have access to prey before than the small ones. Once the elders are satisfied, the others can approach the carcasses of the unfortunate prey. Despite this dominating behavior, violence between members is almost nil. These sharks perform their hunting activities during the nights, and because of their indiscriminate eating habits, they usually ingest non-edible objects and tastes human flesh, although attacks are rare. They usually ingest non-edible objects and tastes human flesh. Both male and female have multiple sexual partners throughout their life, which is about 27 years in the wild. The female reaches sexual maturity around eight years old and the male at seven years old. There is little information about the existence of a process of courtship. It is known that the female mates once every three years and reproduces through ovoviviparity. Fertilization occurs in different seasons in the southern hemisphere and the northern hemisphere. In the first, fertilization occurs between March and May and in the latter occurs between November and January. The embryos develop inside the uterus and feed on the yolk sac and the secretions produced by the uterus. After 14-16 months the female gives birth to about 10-82 fully developed offspring which can survive without the help of the parents. It has a status as a “Near Threatened” species on the IUCN Red List as a result of commercial and recreational overfishing. Like other species of sharks, their capture is highly demanded because some people believe that their fins have excellent nutritious, healing and aphrodisiac properties. Their skin, meat, and liver are also used for different human purposes. At present, there are no specific conservation actions for the tiger shark but some marine life conservation organizations are pushing for stopping overfishing. Other initiatives insist on establishing a catch limit for fishers. World of Animals Magazine. Issue 1. Imagine publishing.